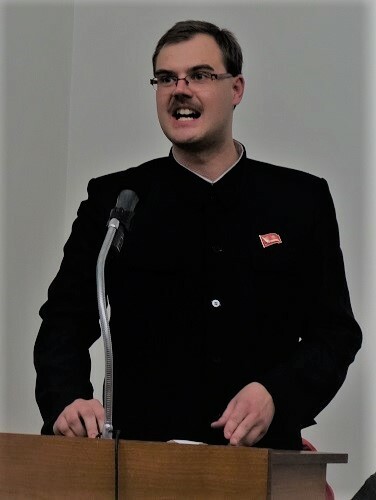 it is my honor to greet today’s international conference held in the year of the 70th anniversary of the victory of the Czechoslovak working people over the bourgeoisie and reaction in February 1948, but also in the 70th anniversary of the foundation of the Democratic People’s Republic of Korea in September 1948. Remembering this year’s anniversaries of history of the international communist movement, I cannot forget the 110th anniversary of the birth of comrade Enver Hoxha in October. These three anniversaries are closely related to the concept of revolutionary movement theory and the fate of its development not only in the three countries mentioned. In the second half of the 1940s and the first half of the 1950s, Czechoslovakia, north Korea and Albania were firmly united with the other states of the socialist camp, headed by the Soviet Union, where comrade Joseph Vissarionovich Stalin at the head of the Bolshevik Party was ingeniously developing and practicing the theory of Marxism-Leninism. The confrontation of Tito’s Yugoslavia with the Soviet leadership and the Information Bureau led to the understendable western orientation of Yugoslavia and the restoration of the capitalist economy with all the devastating consequences. In other people’s democratic countries, thanks to the creative application of the revolutionary Marxist-Leninist theory and Soviet experience, in a very short period of time, in the extremely difficult conditions, it was able to build the foundations of socialism, eliminate the exploitation of man by man and tragic phenomena typical of capitalism, such as unemployment and homelessness. Great success has been achieved in the upbringing of a new people in the spirit of collectivism, the development of socialist morality and progressive culture. The crushing blow for the socialist revolution in the Soviet Union, in people’s democratic and capitalist states, was brought about the dishonouring of comrade Stalin’s remembrance, carried out shortly after his death by the Soviet leadership. The Soviet revisionists soon buried the immense prestige of the Soviet Union in the eyes of the progressive people of the world, confirming all the defamation that had been invented for decades by hostile forces. The continuity of the revolutionary theory has been destroyed and revolutionary traditions trampled by condemnation of Stalin’s work and a by statement that the Soviet Union and the communist movement were lead for 30 years by a miserable theorist and criminal practitioner in one person. Hand in hand with the defamation of Stalin’s personality was the application of market principles, which he particularly warned against in recent years of his life. The result was a breakdown in economy and morality, hand in hand with attempts to counter-revolutionary coup. Also at the building of Prague main train station there was shining Khrushchev’s slogan saying that the generation of people from the 1960s will live in communism. A great part of the population of that time, after less than 30 years, has lived to see restored capitalism. It is no secret that the counter-revolutionary coups were led and the stealing of national property was largely driven by former members and officials of the ruling communist and workers‘ parties, formally trained in Marxism-Leninism. The bureaucratic degeneration of the revolutionary party, which Trotsky attributed to Stalin, was fully manifested by the rejection of Stalin’s work. There were few personalities who opposed the betrayal of Khrushchev’s clique, and their voice was late. The turning point was the speech of comrade Enver Hoxha at the meeting of 81 communist and workers‘ parties in Moscow in November 1960. Most of the parties remained faithful to Soviet revisionism, or even fell to right-wing opportunism even more. Significantly, within a few years, relations between the USSR and China became more acute than relations of both this states with US, and 50 years ago they have gone into armed conflict. Czechoslovak revisionists faced at the same time the military intervention of the Soviet revisionists when they escaped their control. Even in the remaining countries, which continue to claim socialism, there has been a revival of the market economy with all contradictions, a terrible increase in social inequality and disruption of morality. This was largely avoided by the heroic Democratic People’s Republic of Korea. There has been no restoration of private ownership and liberalization. The study of its experience is worth all the more that the current negotiations with the main bulwark of imperialism – the US, with the south Korean puppet regime and opportunistic China, may pose a greater threat to the cause of socialism than criminal sanctions and war threats. When Gorbachev’s clique culminated the agony of Soviet revisionism, the Communist Party of Czechoslovakia voluntarily surrendered its power and did not stop the revival of capitalism; it delivered the entire national economy to domestic and foreign thieves, and the national defence delivered to the service of the warmongers of the NATO. It transformed itself into a reformist party, in practice supporting capitalism, although it retained the name „communist“ as a misleading advertisement, which remained in three decades after the counter-revolution one of the most powerful political parties in the Czech Republic. But living only from nostalgia and misleading advertising cannot be done forever, so the electoral results of recent years show that even the Communist Party of Bohemia and Moravia is becoming insignificant. There is no systematic political education in this party since the counter-revolution. Both the program and the regulations of the Party are, by their very nature, antisocialist as well as the practical work of the vast majority of the leadership. The result is not only a total ideological disunity in the party but also a low number of younger members, their substantial passivity, helplessness and opportunism. Most of the young followers of socialism I have recognized were discouraged by the Communist Party of Bohemia and Moravia from any political involvement. The basic question for the success of socialism is to carry forward the revolution from one generation to the next. This has not been done in the revisionist socialist countries, but also not in anti-revisionist Albania. Without respect for revolutionary traditions and revolutionary forerunners, without class education and creative application of scientific socialist theory, this is impossible. In socialist Korea, the third generation of people, who are masters of revolution and inspiration for the progressive people of the world, grows in the care of the Workers‘ Party of Korea. The respected Supreme Leader comrade Kim Jong Un at the 7th Congress of the Workers‘ Party of Korea in May 2016 set up the challenge of education in the first place and raised the shield to bourgeois liberalism and reforms. He emphasized the priority of ideology, the importance of comradeship and the formation of whole society as a harmonious family. He called for the decisive implementation of the scientific, cultural and ideological revolution, the development of the power of collectivism, the flourishing of socialist art, burning optimism for the revolution, and the fight against ideological and cultural poisoning. As comrade Kim Jong Un said, the collapse of socialism in some countries was in no way a failure of the socialist ideal. Socialism, with its scientific accuracy and veracity, is endowed with eternal vitality.